Dan Trueman talks about metronomes, laptops, and game controllers â€” all tools in his music for the ensemble So Percussion. The metronome provides an invisible blueprint for music. That time-tested pendulum timekeeper is employed in analog and digital form by musicians of all stripes. Yet by the time those musicians perform live or in a recording setting, the metronome itself has been relegated back to the closet. But now, as part of an expansive, highly engaging evening-length program, titled neither Anvil nor Pulley, the composer Dan Trueman has brought the metronome into an unfamiliar role as a performance instrument. Not that there aren’t precedents, notably including György Ligeti’s “Poeme symphonique” (1962) for 100 metronomes, and an even earlier work, “Music for Electric Metronomes” by Toshi Ichiyanagi. But as a testament to Trueman’s ingenuity, the metronome is employed both as object and inspiration: both as a sound source, and as a touchstone for a variety of metric and percusssive explorations. And, furthermore, the metronome is simply one among numerous objects that are used untraditionally in the work. There’s the turntable that plays archaic fiddle music — or at least what appears to be archaic fiddle music, except that it’s actually original work by Trueman, to which he added the patina of vinyl surface noise. There are controllers (“tethers” as he calls them) that date back to a decade-old golf video game. There are speaker drivers attached to large acoustic drums (see image up top). There are the laptop computers, a tool that Trueman has actively pursued in PLOrK, the Princeton Laptop Orchestra, which he and Perry Cook cofounded in 2005. In an extended interview-via-correspondence, Trueman discussed at length the role that these varied objects play a role in his compositioanl practice; about the collaborative give and take involved in working with So Percussion members Eric Beach, Josh Quillen, Adam Sliwinski, and Jason Treuting; about his teaching at Princeton; and about why the word “classical” just doesn’t cut it anymore. Marc Weidenbaum: This is an overly long opening question, but please take that as an expression of enthusiasm. I want to start the interview by focusing on the opening parts of four of the work’s five parts. All but “Feedback,” the Bach exploration, begin with very quiet sounds: the surface hiss of vinyl, the tiny tick of the metronome. I’m fascinated by the employment of these elements, because I have come to wonder — not just in your music, but in that of Arvo PÃ¤rt and Max Richter, not to mention people like Steve Roden and Carsten Nicolai — how much they represent a compositional approach that comes after not only the introduction of recorded music, but after the introduction of the CD and, later, digital audio files. Do you see that as “new,”somehow, the composer’s comfort with sounds that might, before 1980, or perhaps 1880, not have been inherently presumed to be audible to an audience? Dan Trueman: Absolutely. My way into electronic music back in the day was through the electric violin, and the main attraction to me was not being able to play loud, but being able to play soft, and have the details magnified and audible. So, for instance, the noise of barely speaking ponticello or tasto on the violin strings with all the whispery harmonics, the gentle grit of the rosined horse-hair on steel; these were elements that were practically unavailable before amplification. Which means that I’m not really answering your question! But, what I think it means is that my attraction to the qualities that the very soft sounds have, and the fact that they were now available through amplification, led to an interest in a whole world of sounds that wouldn’t have been practically available, or considered “musical.” So, record hiss, the drop of the needle, the minute click of a single digital sample (which sounds like a digital artifact, and is traditionally avoided in “computer music”), all of these are now part of a larger world of small sounds that are inherently technological. For me, these are part of the palette, the way traditional instrumental sounds are. Weidenbaum: That’s great that the whole “microsound”aspect was something you had been so attentive to. Of course, I am not surprised, and the way you laid it out is very helpful. To follow up, I have another question. Allowing that much of this work is technologically facilitated, are there pre-electronic premonitions for you, works from the canon that set up what you are now exploring. I think Morton Feldman’s music, and some of Olivier Messiaen’s, play this role. The opening half minute or so of Mahler’s first symphony has long been a “classical ambient” touchstone for me. But I think I’m asking even further back. Trueman: Feldman has long been a huge influence. Pieces like Piano and String Quartet and “Patterns in a Chromatic Field”in particular, with their incredible sonorities and intense quiet. But earlier, [Igor] Stravinsky’s Symphony of Winds has also been very important for me, with its “moments” that just seem to sit, or float. [John] Cage’s String Quartet in Four Parts is another, the [György] Ligeti piano music (the Ã‰tudes, “Musica Ricercata”), much of [Louis] Andriessen’s music (“Hadewijch”comes to mind). Now this is going to sound terribly old fashioned, but I just can’t get enough of Bach, even after all these years. So many things about his music, but in this conversation, I’ll mention one moment: well into the epic D-minor Chaconne, from the solo violin partita, he moves ever so delicately to D-major, and in some of the best performances I’ve heard, this move happens so quietly and delicately it can barely be heard. Even earlier, renaissance vocal music like [Orlando de] Lassus; I actually grew up singing stuff like this, informally with my family. But I really need to mention pre-electronic fiddlers that have been hugely influential, like CaoimhÃ­n Ã“ Raghallaigh, who is an absolute master at what I suppose we might call “microsound fiddle playing.” I’ve never heard a fiddler play more quietly and with more color and space than CaoimhÃ­n; it is astonishing and mesmerizing. His colleague the singer Iarla Ã“ Lionaird has a different but somehow similarly austere sort of expressivity in his voice; I can’t get enough of it. And then there is the glow and sparkle that Norwegian fiddlers like Hauk Buen have; it’s a sound that remains stuck in my ears and something I aspire to, often indirectly, but also directly. Weidenbaum: Speaking of which, what does the term “classical music” mean to you? Do you engage with the term directly? I’ve been fascinated by its seeming decrease in prominence among a certain generation of young composers. Trueman: I’ve mostly forgotten that term, and really don’t like it. I suppose I use it occasionally when under duress, in a conversation with someone who isn’t really into music much, but it really doesn’t feel useful, and has lots of baggage. Weidenbaum: There is considerable thought evident in your broader writings about your work — so much interesting context that has informed my listening — on your website, in your tech overview, in the score itself. How do you decide how much information to put in the album’s liner note? Trueman: Well, there is the program note and the liner note. I think of program notes as an extension of the piece, helping set the stage for the listener, offering them ways into the piece that reflect my own thoughts about what I was after. With some pieces this is more important than in others, and I think with neither Anvil nor Pulley, they are quite important, because of the scale of the work, the unusual things i’m asking the performers to do, the mysterious fiddle tunes, and so on. I find it hard work to write these notes (I prefer just to write music! ), and am always frustrated with them, but i think not having them would be unfair, given that I’m asking people to give 45 minutes of their complete attention to something I’ve made, something that is, I think it is fair to say, unlike anything else they have likely encountered. One specific aspect of this has to do with new technologies. I really don’t want my notes to turn into a geek-fest, drawing the focus of the listener into how I’ve done things, or trying to impress them with technological prowess. Of course, questions about how everything works are inevitable, and I welcome them, but I really hope they become fused into a larger, musical experience that is as compelling as possible. On the other hand, for other geeks like me who are interested, I like to make it known what’s going on; this is all part of the dialog that these pieces should inspire, I hope. In this case, So Percussion made the decision about what to include in the actual liner notes, and these days with digital releases and PDFs, it’s really nice to be able to include a lot. I like what they’ve done, with the mixture of artwork, photos, excerpts of computer code, text, and so on. In fact, I’m amazed at how comprehensively they have looked at how to release something like this; the LPs, the speaker-driver, and the tether releases, are all really amazing, beautiful and thought provoking (and specially appropriate to neither Anvil nor Pulley), I think, and that really was all So Percussion’s work. Weidenbaum: How did all those untraditional release formats come to be? That’s all So Percussion’s doing. They did a really neat no-CD release last year — the Cage Bootlegs — where they really tried to mark the release in a special way without actually pressing a CD, something that seems increasingly pointless. I love how thoughtful they’ve been, and how their ideas really came directly from the piece. The LP-sized artwork is stunning, and then simply holding an actual old LP in your hands when first engaging with this piece, hearing the needle drop, will be quite something, I hope. Weidenbaum: Did you explore using existing recordings of fiddle music before employing your own? Trueman: No, I wanted to use those tunes in particular, two of which I wrote specifically for neither Anvil nor Pulley, because of their sense of time. The first one, which really locks into a foot-stomping 120bpm, gives way to the 120bpm digital clicks in a way I really love, and the last one has such a warped, physical sense of time that feels so different than what machines normally give us. And the lyricism of the second fiddle tune seemed almost needed — like a bit of ginger — between the intensity and abstractness of “120bpm”and “Feedback.”I also wanted to give them some old fashioned notes to play; I remember seeing Adam [Sliwinski] work on “Hang Dog”in an early rehearsal, before I had even decided to include the other two fiddle tunes, and was struck by how much he loves to shape phrases, and how good at it he is — I felt the piece needed more of that! Weidenbaum: Were either of these pieces of music on your mind as you worked on “120bpm”: György Ligeti’s “PoÃ¨me Symphonique” or Toshi Ichiyanagi’s “Music for Electric Metronomes”? 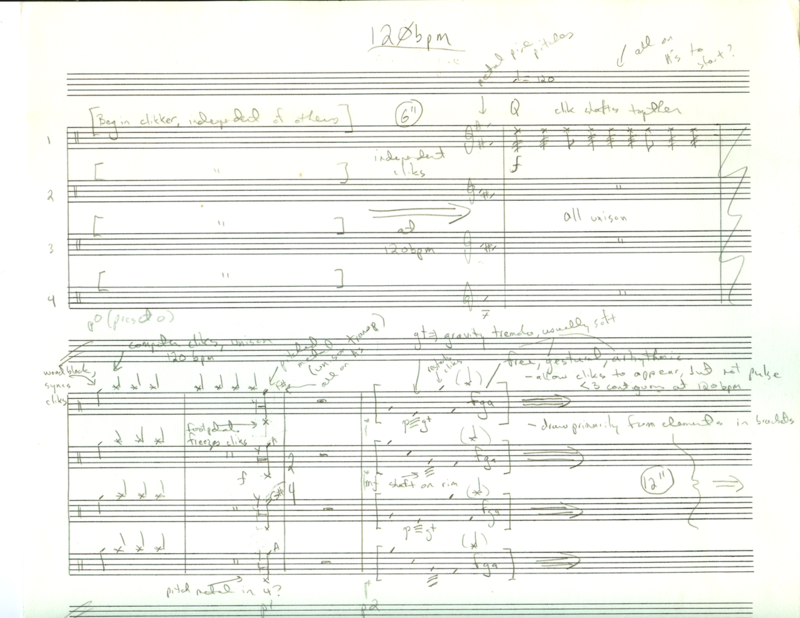 Weidenbaum: Clearly in a piece like “Another Wallflower,”significant effort goes into this lovely fade, this film-like transition from the recorded version of the melody to the one that is performed in the more traditional sense. How much are you also bringing the surface noise to life? It seems like the tonal material retains the gauzy quality, but that could just be wishful listening on my part. Trueman: That’s interesting! Do you mean, was I specifically composing the tune from the record noise itself? The way that worked is I gave the recording to So Percussion and a very basic notation of the tune (two voices, since it’s double-stops, and the foot-stomping patterns), and then they worked out how they wanted to play it, and when they wanted to remove the actual recording (they could have played the whole first track with the fiddle if they wanted). Since they did this with the old, hissy version of the tune, I wouldn’t be at all surprised if some of what they did reflects the specific qualities of the recording itself, especially in Jason’s case; he has such a colorful touch with the drums, the snare in particular, and I’m sure, even without thinking, that some of what he does comes from the complete sense of that noisy recording. Weidenbaum: How did this project originate, your composing this specific work for this specific ensemble? Trueman: I had worked with So Percussion on another evening length piece, (Five (and-a-half) Gardens, a collaboration between So Percussion and my duo, Trollstilt) and I also play with Jason [Treuting] in a band (QQQ), so we have a long history of working together. So Percussion were putting together a program of new commissions for their first full show at Zankel and asked me if I would write them something new, just for them and possibly with laptops, for that concert. Since I had worked with them so much, and since I trust their abilities so much, I wanted to collaborate with them on the process, and this piece wouldn’t have turned out this way without that. “120bpm”is fully notated and composed in a traditional sense, but “Feedback”was a much more collaborative (and scary) creation, one where I had built the instruments for them to play and a rough outline of the work, but one that didn’t come to life until we workshopped together, extensively (once, in front of an audience at the So Percussion Summer Institute, which was particularly frightening!). And of course, the fiddle tunes as I described, where I really wanted them to find ways into those tunes themselves, the way “folk” musicians do. Weidenbaum: Can you describe your academic mode? Are you tenured at Princeton? What courses do you teach? Trueman: I’m extraordinarily fortunate to be tenured at Princeton, where I have some wonderful and inspiring colleagues and students. This is far more than you’ll want to see, but i recently took part in a symposium on what we do here and presented this paper, which does, I think, present a fair picture of our idiosyncratic, very open program. I’ve taught 16th- and 18th-century counterpoint here for many years, and then I teach a variety of other courses, like the PLOrk courses, graduate seminars in electronic music, instrument building, comparative coding, or non-electronic subjects like rhythm/meter/groove, theft by ear, or, this coming fall, intercultural music with Donnacha Dennehy, a good friend and visiting composer here at Princeton. Weidenbaum: I find myself paying special attention to your emphasis on the computer-as-instrument. Because of its wide breadth of possibilities, its ability to multi-task, to network, the computer differs significantly from what was considered an instrument before it. How hard do you work to limit the computer’s role in a specific work, so as to find a balance with instruments that predate it? I feel like there is a parallel between the chance elements in “120bpm” and the way that PLOrk has helped pushed the laptop beyond synchronization. Trueman: Right, such an important question. With PLOrk, I’ve found that the most important challenge is calibrating the “player’s” level of engagement and effort with the computer. Obviously, they can just press a button and then sit back and let it do its thing (and there are times for this!, not unlike striking a gong and listening to the glow for minutes), or they can be asked to try to master something that takes hours and hours (or years and years) to master (this is actually quite hard to reach, frankly, and possibly pointless). For me, I want the player to be deeply engaged in the musical experience, sometimes to break a sweat, sometimes to be seriously challenged, sometimes to simply enjoy the process of engaging with sound in a straightforward but new way (the “tethers” in “120bpm,”for instance). And while I do often think of these things that I make for people to play as “instruments” I also often think of them as “machines” that we are trying to harness, not unlike, say, a race car. You think of a race car driver: they aren’t physically making the car go, but rather they are trying to control it in virtuosic ways, making it go as fast and as nimbly as possible, and in turn the driver is taken on a ride that would simply be impossible with the “machine.” We should have more musical “instruments” that are like race cars! And, in this case, I had the Andrettis of the percussion world to drive. The “sync” issue that you bring up is interesting, and I can’t say that I was thinking of it explicitly when working on the aleatoric sections in “120bpm,”though it does make perfect sense. One of their main roles as players is to sync and de-sync the digital metronomes on their individual laptops, and these aleatoric sections willfully ask them to de-sync and to partially repress the metronomes. Weidenbaum: The next step beyond syncing is the network, computers reacting to each other — computers working in symphony, as it were. Do you do any network-based composition and performance? Trueman: Absolutely, quite a lot. I use it some in the “Four Squared for Ligeti”I mentioned, and others like “Clapping Machine Music Variations,”but that usage is really embedded in the fabric of the piece and is not foregrounded. Several years ago, when PLOrk first started, I explored this a lot, in particular with this piece [see: turbulence.org. I’m fascinated by the possibilities of LANs and music making (as opposed to distance networking), whether dealing with actual time sync or simply sharing of information of various sorts while performing. That said, I’m still figuring out how to calibrate when to use it; in neither Anvil nor Pulley I don’t use it at all, and I really do prefer to have the players do the syncing, and have the syncing be fluid and part of the musical performance process. This is of course especially true with a group like So Percussion, who have such an incredible relationship with sync and time. 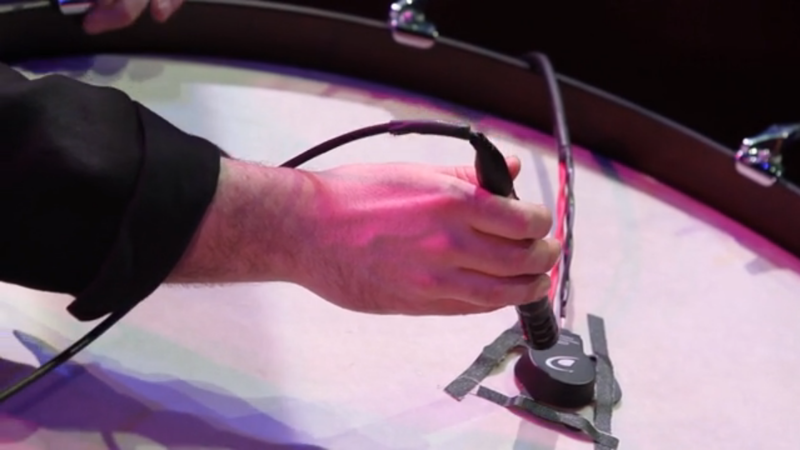 More on So Percussion at sopercussion.com. More on the album at bangonacan.org. More on Dan Trueman at manyarrowsmusic.com and princeton.edu.